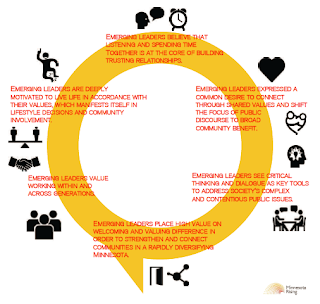 Whether to build more inclusive and welcoming communities, bridge political differences, or resolve conflicts, emerging leaders highlighted the central importance of trusting relationships. In order to build trusting relationships, participants noted the necessary ingredients as listening and spending time together, highlighting the importance of face-to-face interaction. “These days, communities are so large that you’re not going to be able to have one-to-one conversations with 20,000 people. 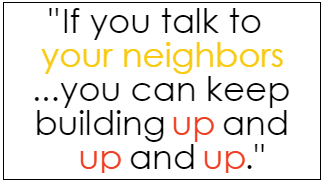 But if you talk to your neighbors, your neighborhood, start on that smaller level, you can keep building up and up and up. Express the ways that you want to improve the community, present some ideas and others can give you feedback and you can trust-build from one-to-one, face-to-face conversations. Not just giving words, but also giving actions. Words are important to build upon with actions, but without action, the trust doesn’t really have a foundation." They emphasized it is the way that emerging leaders can learn about people, share in their wisdom, and build common experiences. 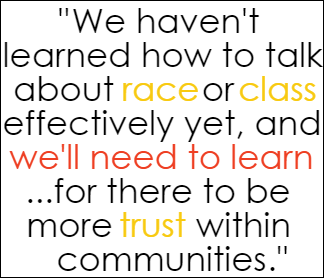 Participants expressed that building trusting relationships will create spaces where people can have difficult and necessary conversations about topics like race, gender, and socioeconomic status, and their implications for how we live and work together. “Within Minneapolis and just in the Twin Cities in general, we have a really hard time talking effectively, openly, and honestly about all sorts of things. Especially things like racism and sexism and homophobia and transphobia. I think we're really afraid to talk about race in particular in Minneapolis and St. Paul. Oddly enough we're okay talking about gender, at least for white women and white men. 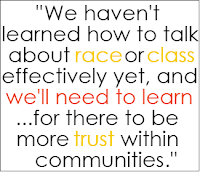 We haven't learned how to talk about race or class effectively yet, and we'll need to learn to do that well in order for there to be more trust within communities."